and your health is your biggest asset!" 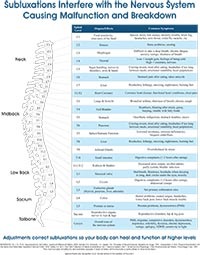 Once a Neurostructural Shift is present and disrupting the spinal nerves and spinal cord, it can create many different secondary conditions or symptoms. The reason these are called secondary conditions is because they are a result of the primary Neurostructural Shift, or the underlying cause. The location of the Neurostructural Shift and where the nerves are being disrupted will give us an idea about your secondary conditions.